My project management tool kit has two primary tools: Gantt charts and punch lists. 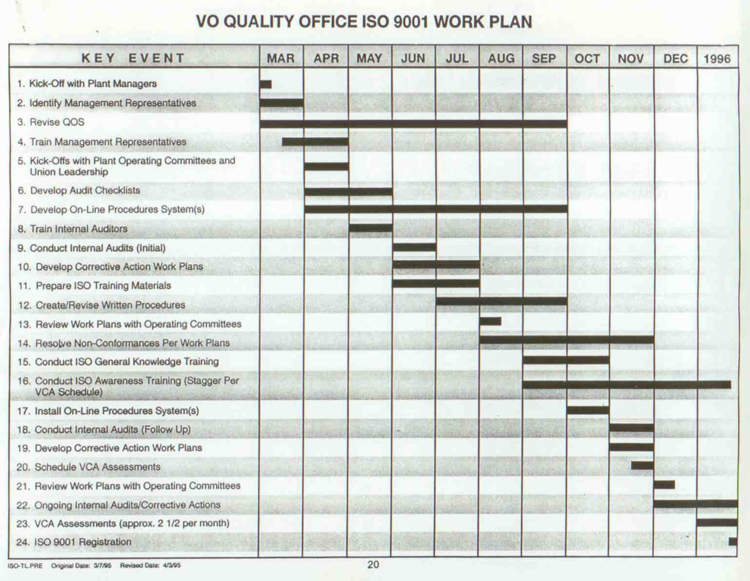 First, I use a Gantt chart to visualize the project. A Gantt chart provides a visual schedule of major project elements: start dates, end dates, what can be done in parallel, what must be done in sequence. A Gantt chart about two or three dozen rows deep is usually enough detail. Depending on the duration of the project, time increments can be in days, weeks, or months. TIP: The depth of a Gantt chart in a time period indicates how many tasks must be worked on simultaneously. If your Gantt chart goes vertical, consider spreading out the work. Second, I set up a punch list for specific tasks: who, what, and when. A punch list provides the detail behind the Gantt chart. 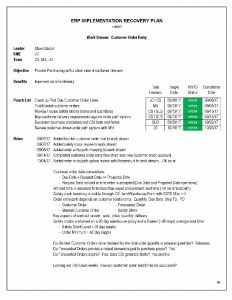 As assignments, punch list line items are much more detailed than those on the Gantt chart. 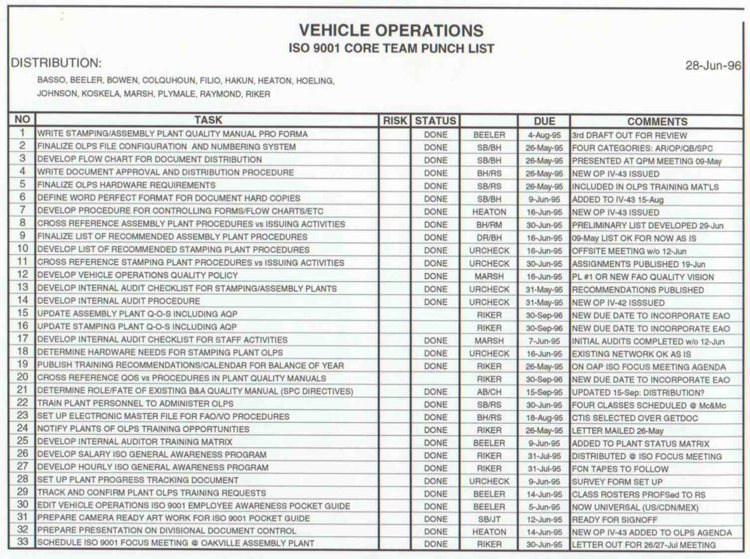 A project can have 50, 100, or more punch list line items. The punch list is a dynamic document capturing learning as the project moves forward. Nobody can think of everything. TIP: Write Gantt chart and punch list entries in a “do something” format: design logo, assemble prototype, etc. Pairing an action with an object provides clear, concise task definition. Critical path analysis? Any line item on the Gantt chart that requires an invention, regulatory approval, or some other uncertainty needs to be managed carefully. I pull risky line items as far forward as possible to provide slack time. Then I make sure the associated punch list tasks are going full speed. On the odd occasion that a project does not lend itself to a Gantt chart and punch list, I improvise. The third case study vignette outlines a project where the work naturally split into multiple workstreams and I designed a hybrid form to define tasks, responsibilities, and timing. I am not a fan of Microsoft Project. It is a very powerful tool, no argument there, but it inevitably leads to loosing track of the forest for the trees. Unless you are providing project management on the next 747, a Gantt chart and punch list will do just fine. In the mid 90’s, Ford was embarking on a global re-organization to transform itself from a collection of regional car companies to an integrated global car company. One element of this strategy was to register world-wide to ISO 9001 (a first for the domestics) and the deadline was less than two years away. I found myself on a three-man project management leadership team responsible for registering the 31 assembly and stamping plants in the U.S., Canada, and Mexico. We split the work into three parts: the plants, the interfaces with the rest of the company (primarily product development), and the pilot plant that contained manufacturing engineering / prototype build activities. One of my first steps was to design the project with a Gantt chart. Both the stamping/assembly plants and pilot plant would have to prepare in parallel to make the deadline. The conundrum was that we wanted one ISO quality system, not dozens of them. To align all of this frantic activity, I developed a quality manual pro forma that outlined in great detail the corporate, divisional, and local procedures required to meet the standard. I started a punch list to keep track of all the specific assignments and there were lots of them…five full pages worth. Later, I wrote the copy for an ISO 9001 pocket guide, a nifty little educational tool. Something like 75,000 copies were printed…and then the pocket guide format went global! To make a long story short, the 31 assembly and stamping plants as well as the pilot plant all passed their third-party audits with two or three months to spare. Whew! TIP: The larger and longer the project, the more important it is to communicate the work plan early…and to obtain buy in. 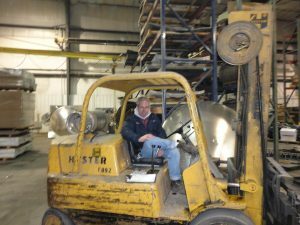 I was contracted by a private equity owned manufacturer of tank trailers to provide project management for a capacity expansion and plant rearrangement. Between fracking in the U.S. and the tar sands in Canada, demand for tank trailers was booming. 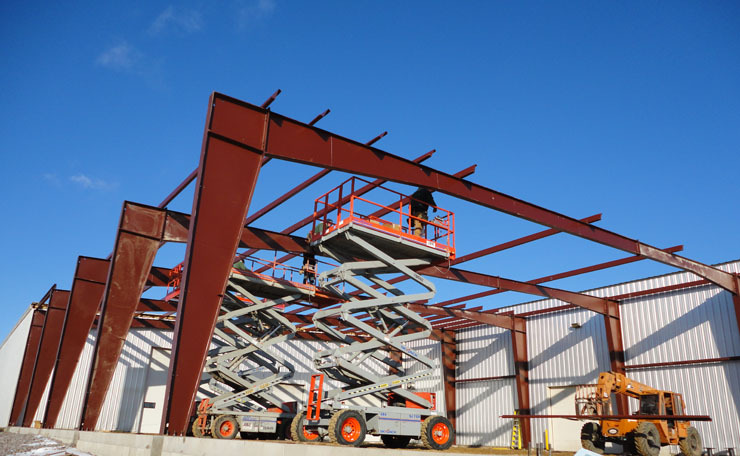 The scope of the project included three building additions, the installation of a building-length overhead crane, and 100+ machine moves and/or new installations all while maintaining trailer production. As is usually the case, my first step was to design the project with a Gantt chart. Even with the building additions, floor space was very tight. I used sticky notes on a plant layout to experiment with different move sequences. After a few iterations, I had a viable work plan. The seven-month project kicked off in early November. Punch lists were used for each step in the move sequence. A complicating factor was the approach of the harsh Minnesota winter and its effect on construction. Targets of opportunity were identified for good days to pour concrete. TIP: Inevitably in a comprehensive plant rearrangement, something will have to be moved twice. Don’t fret over it. A private equity owned manufacturer of multi-wall bags for seed, food, and animal health products was struggling with the launch of its new ERP system. I was contracted to provide project management and problem solving leadership. To make a difference in a hurry, working in parallel was imperative. I developed a 90-day recovery plan across eight work streams: Production Reporting, Customer Order Entry, Purchasing, Scheduling, Inventory Control, Shipping, and Data Integrity. 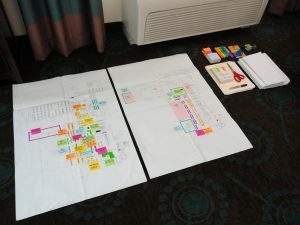 Each work stream had its own hybrid project management chart: a punch list with RED/YELLOW/GREEN reporting for each line item and a place to capture learning. Next, I mapped business processes against MRP tools from order to cash. New tasks were added to the eight work streams to close the gaps that were found. TIP: Project management tools that double as reporting documents are huge time savers.